Completed at the end of 2007, the National Grand Theater ,or “The Egg” by reputation, is one of the most renowned architectural feats of modemChina. An ellipsoid dome of titanium and glass, this opera house is located near an artificial lake, and the combination of the dome and reflection offers an image of an egg. The theatre covers over 200,000 sq. meters, and it houses 6,500 seats and three different halls. Used for operas, ballets, plays, and dances, the Opera Hall seats 2,416, the Music Hall 2,017 and the Theater Hall 1,040. 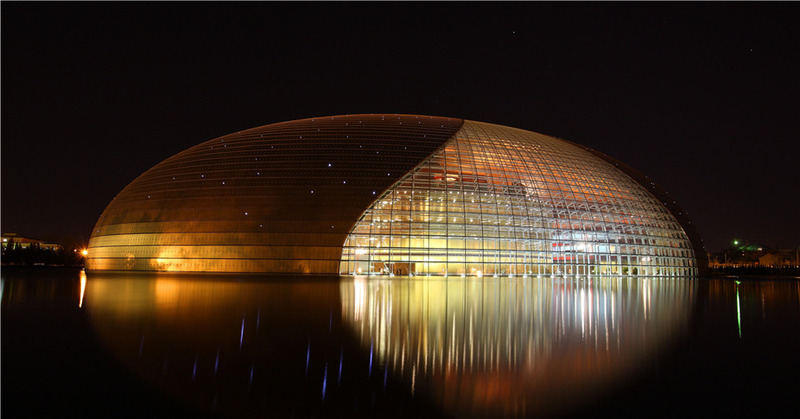 Designed by French architect Pau Andreu, the National Grand Theater is located at the heart of Beijing and is a cultural haven for entertainment. Lao She (1899-1966), real name Shu Qingchun, was a legendary author and playwright ofChina. Bom as a Manchurian decent, Lao She accomplished many feats in his life time, such as writing the book Camel Xiangzi. Known in theUSas the Rickshaw, this book became one of the era's best sellers. During his early years, Lao She taught English at Oriental School of London University and eventually wrote many works, including City of Cats, The Yellow Storm, and The Drum Singers. However, Lao She is most renowned for his drama Tea House, , which was written in 1957. During the Cultural Revolution, public criticism and denouncements unfortunately drove Lao She to suicide on August 24,1966. Lao She's Teahouse was built in 1988 and is named exactly after Lao She's famous drama. Today, it has evolved into a superb entertainment house with performances by comedians, singers, musicians, acrobats and opera performers. 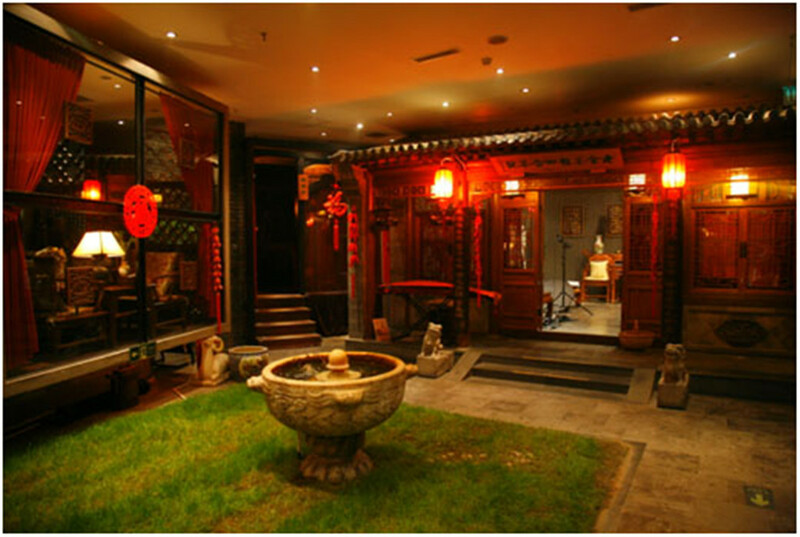 The Entrance of teahouse is a motley of Beijing flavor and culture, Laoshe's Teahouse and the furniture and decorations give a taste of stylishness and elegance. Affordable dinners are offered for visitors, and tourists can enjoy prime examples of Chinese art and literature, while sipping their soothing tea. Lao She's Teahouse is located at Qianmen Xi Da Jie Building #3. In general, the price ranges from 60 to 180 CNY to drink tea and watch a performance. Located on Chang'an Avenue, the Chang， an Grand Theater is a famous Beijing opera house that holds high-level performances. This is modem theater is a place where people can come and experience a festive time. From music to martial arts, this grand theater showcases a wide»range of traditional Chinese history, culture, and mythology. 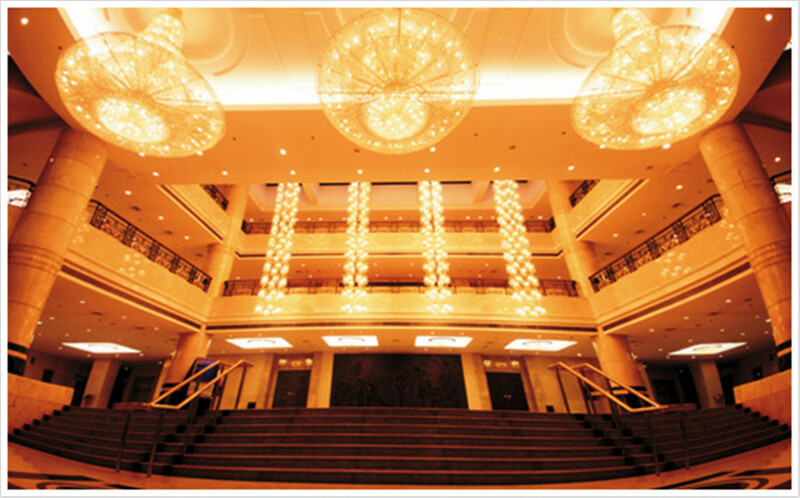 However, this 800-seat opera house is most renowned for its Peking Opera, also called Jingju. There is a monument designed like the facial makeup of opera singers at the entrance. 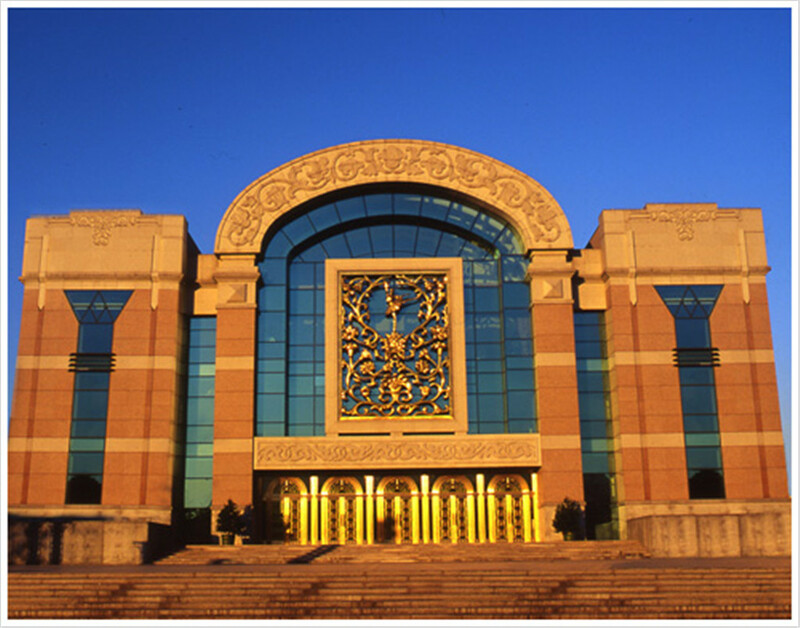 The colorful costumes, facial makeup, musical dialogues, and grand settings make the Chang'an Grand Theaters performances a must-see attraction. For decades, China's most prestigious drama company has been the Beijing People's Art Theater. Similar to Broadway, the actors' first-class performances have left many legacies across the globe, and since 198o，s, the theater has put on over 80 different plays. The theater, in 1904, was the first inChinato put on huaju - or spoken drama - which was adopted from western styles. Since its founding, the theater has put on over 300 plays of different styles, themes, and settings; some plays include Wang Zhaojun, Warning Signals, Xiao Jing Hutong，Weddings and Funerals, Uncle Doggies Nirvana, and some of these have been performed over 100 times. The diverse repertoire offers a superb range of rigorous stagecraft, artistic style, and emotional depth, and the theater has been famous for producing generations of talented actors and actresses. The theater company performs in three theaters: the Capital Theater, the Mini Theater, and the Experimental Theater. 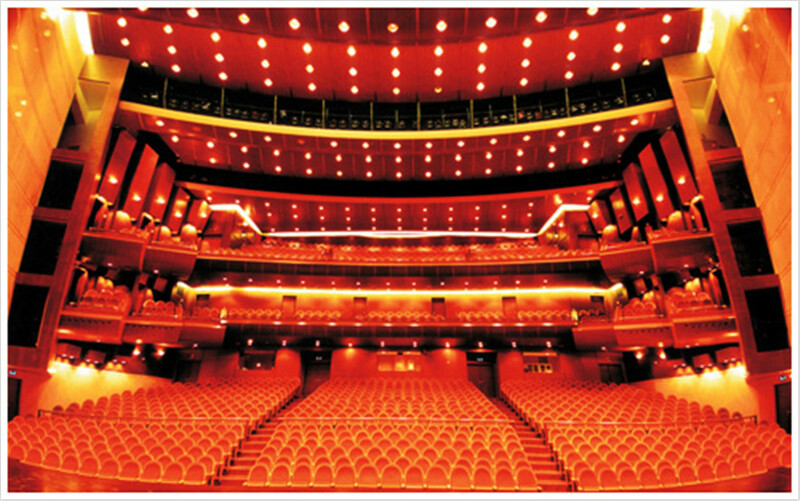 Today, Beijing People's Art Theater has received a huge boost and is starting to perform inChina's National Theater. The People's theater's major success is unquestionably ready to astound all audiences. Beijing Hu Guang Guild Hall (Hu Guang Hui Guan) is easily identified by its traditional style of curved roofs and decorated tiles. Constructed during the reign of Jiaqing (1807), this guild hall used to hold performances of famous opera prodigies, such as Tan Xinpei,Yu Shuyan and Mei Lanfang .On August 25, 1912，the “Father of Modern China” Sun Yat-sen held a meeting at the Beijing Hu Guang Guild Hall; this marked the day of Kuomintang Party's founding. The guild hall, now, also receives academic discussions and caterings as well. Inside, there are colorful birds, luscious flowers, and artistic pavilions. 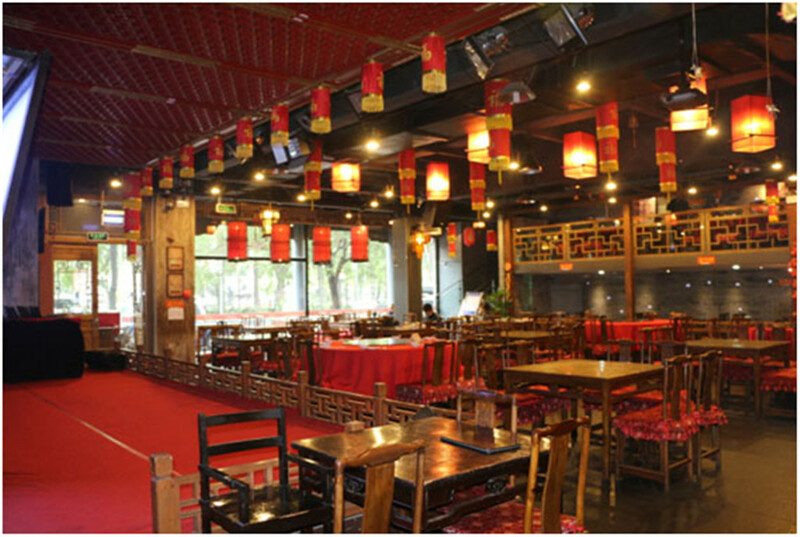 The guild hall houses the Exhibition Hall of Traditional Opera Museum in Beijing, and it provides tea tables along with an intimate atmosphere for any tourist or visitor. The museum showcases photos of famous opera singers in addition to old opera gowns; visitors can also view the adroitly refurbished theater with a decorated traditional stage and gallery seating. Every Saturday and Sunday, many theatergoers and opera masters come to give special performances that truly shine a light upon Beijing's traditions and culture. Tianqiao (Overbridge) Area is one of the unique attractions that tourists should not miss out on. Although named as a bridge, Tianqiao Area is actually a popular mecca for gatherings, delicious foods and beverages, and entertainment. 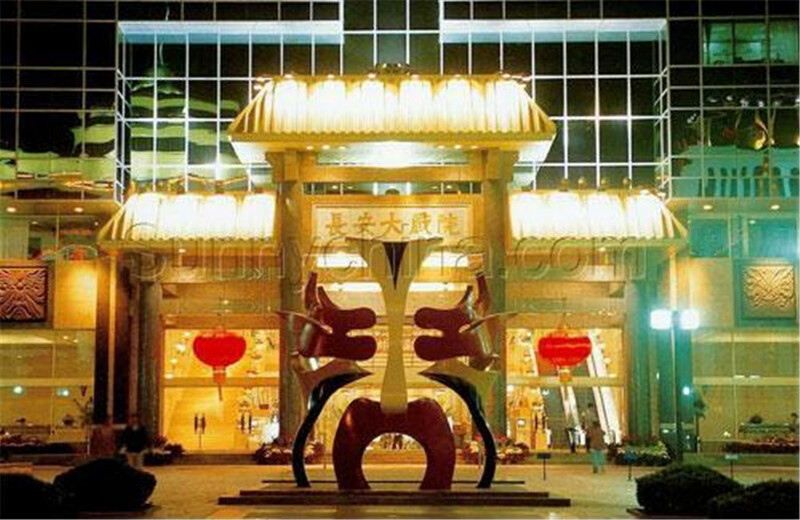 Since the Yuan Dynasty, this popular location has epitomized Chinese entertainment, from acrobats to music. 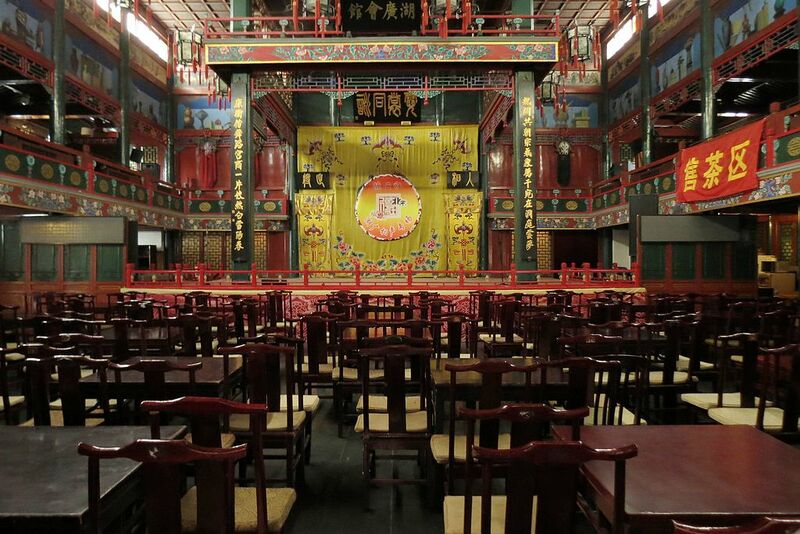 Liyuan Theater is a traditional Chinese Performance stage located inside Qianmen Jianguo Hotel. Beijing Operas and regional folk groups perform nightly, and to the benefit of most visitors, these dramas primarily engage audiences through mimes. Operas often have subtitle boards presenting translations; these luxuries ensure that language barriers will not interfere with the overall experience. To add to the excitement of the performances, you can visit the makeup rooms to witness firsthand the professional actors adorning themselves with exquisite makeup. Also, you can get autographs and pictures with actors after performances. 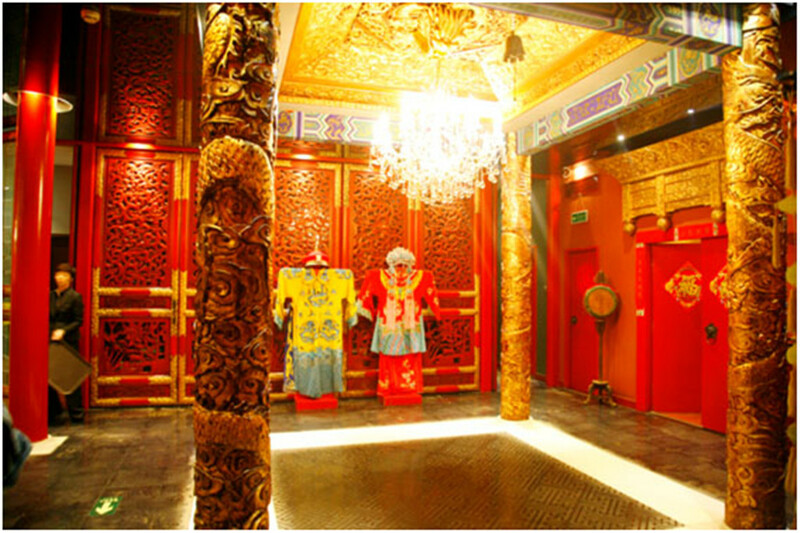 For those interested in background information, the exhibition hall offers the history of Peking Opera along with photos of famous actors and artists. 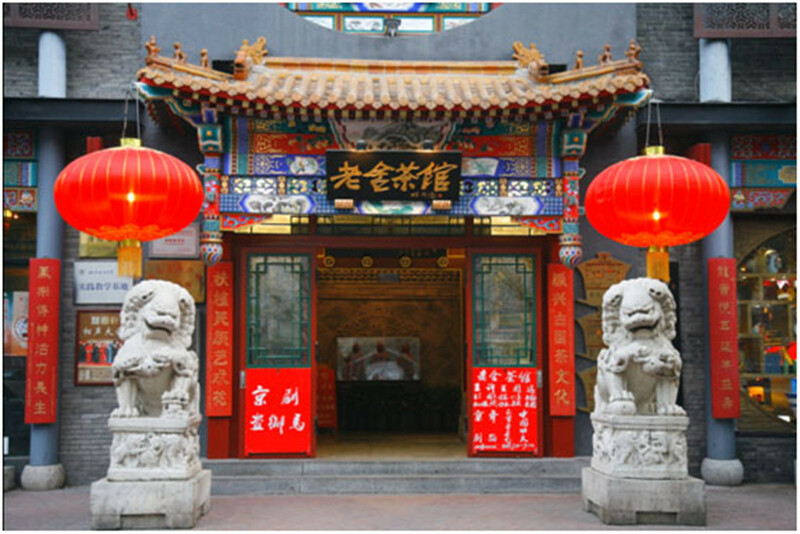 The wonderful experience at the Liyuan Theater can be remembered forever with a small purchase at the souvenir shop. Selling traditional facial makeup, musical instruments, calligraphy, paintings. 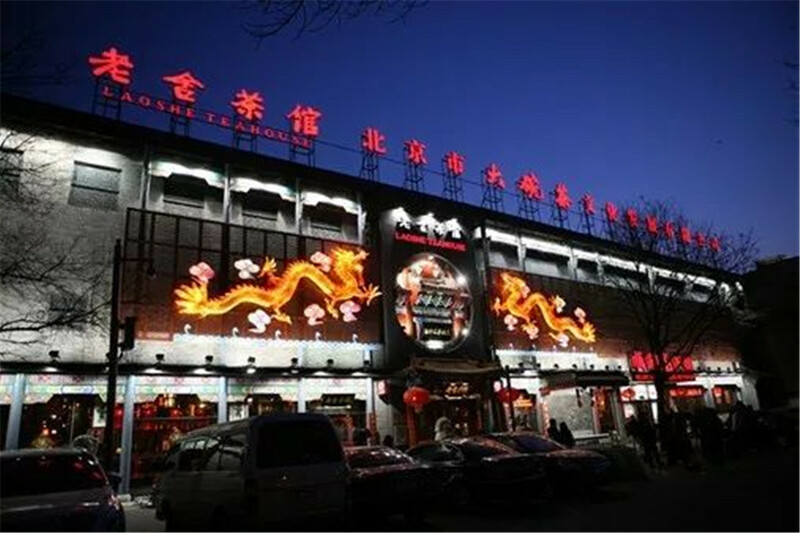 Beijing Night Show is a 90-minute performance located in a grandeur theater in Dayabao Hutong, Dongcheng District. Dedicated to Chinese culture, history and tradition, the performances illustrate today's civilization through dances, music and banquets. Also, visitors can marvel upon the adept entertainers' kungfu and acrobatic expertise; the addition of ethnic customs, cultural costumes, and operas creates another dimension for audiences and actors alike. In the first half of the show, you can also have dinner inside the theater to complete your experience; this banquet offers an exquisite collection of Chinese delicacies from different eras of Chinese history. The lifelike range of Chinese artistic performances makes Beijing Night Show the spotlight of attention for theatergoers.